Apple today announced that it has updated its iMac lineup, introducing new 21.5-inch iMac with Retina 4K Display and 27-inch iMac with Retina 5K Display models. The all-new desktop computers feature faster processors and graphics, two Thunderbolt 2 ports and up to 2TB of Fusion Drive storage for stock configurations. The 4K 21.5-inch iMac has a 3.1GHz Core i7 Broadwell processor and integrated Intel Iris Pro Graphics 6200, while the 5K 27-inch iMacs have 3.2GHz to 3.3GHz Core i5 and i7 Skylake processors and dedicated AMD Radeon R9 GPUs. Apple has also launched all-new Magic accessories, including the Magic Keyboard, Magic Mouse 2 and Magic Trackpad 2. The new Magic Keyboard, $99, features Bluetooth for wireless connectivity and a built-in rechargeable lithium-ion battery that charges fully in about two hours using a Lightning to USB cable. The redesigned keyboard has a reengineered scissor mechanism with 33% more key stability and a lower profile for more precise and comfortable typing. The new Magic Trackpad 2, $129, features Force Touch and a larger edge-to-edge glass design with 29% more surface area. The new Magic Mouse 2, $79, also has a built-in rechargeable lithium-ion battery and redesigned internal structure that includes fewer moving parts. The trio of new wireless accessories are available through Apple and resellers today. The new 4K 21.5-inch and 5K 27-inch iMac are available today through the Apple Store, Apple Online Store and select authorized resellers, with pricing starting at $1,499 and $1,799 respectively. 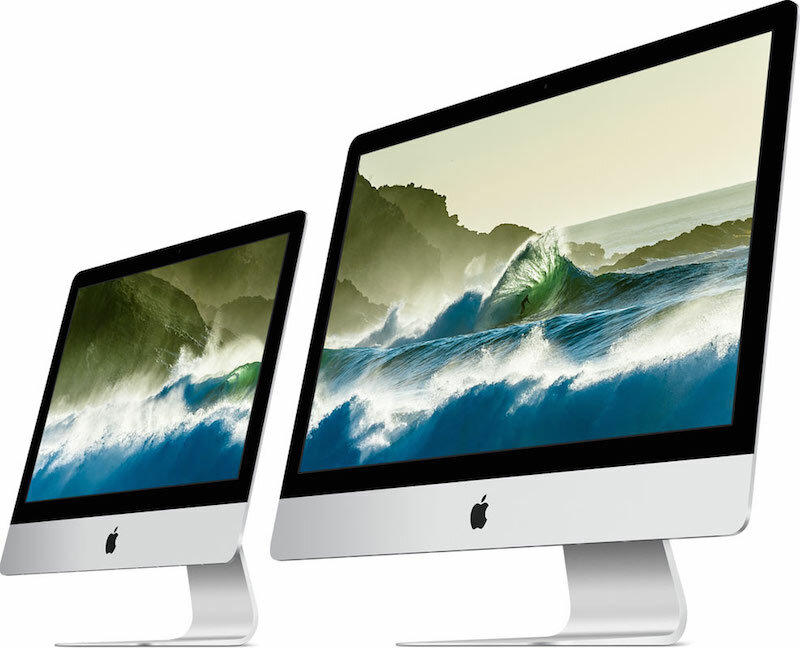 Apple will also continue selling the non-Retina 21.5-inch iMac in two models starting at $1,099 and $1,299. The new iMacs include a Magic Keyboard and Magic Mouse 2 in the box. Aw damn, no new keyboard version with the right number pad. Shame. Well that's pretty crap. Keyboard and mouse are no improvement at all, trackpad is the only thing worth upgrading. As for the new retina 21.5" iMac. 5400RPM HDD?! Is that honestly a joke? It's a shame, because I remember a few years back Apple was known to provide user experience above all else, now it seems they're prioritizing profit over user experience, then jacking up prices on things even more. I used to be a diehard apple fan, but i'm starting to lose my enthusiasm. Apple products have always had a premium, but for a reason. I don't know how Apple execs could be genuinely "proud" of the products they're shipping at these prices. Looks like decent upgrades. But can't believe that some sort of Fusion configuration still isn't standard across all models. Why the hell do they use Lightning for charging? It's a Mac, not an iOS device, and USB-C connectors are available and would make much more sense. Why is the power port on the mouse so badly placed so you can't use it and charge it? Why (from the Verge review) as the keyboard inherited the same lack of travel as the deity-forsaken Macbook keyboard? The Lightning connection makes no sense what-so-ever unless they are planning on unleashing mice and external trackpads for the iPad (yeah that would make wacko sense). The REAL reason is that they don't want to admit that the Lightning connector was STUPID to make in the first place. It's only USB2 speeds and USB-C makes it 100% OBSOLETE in every respect. So why aren't they designign for USB-C when it's the future of both desktops and mobile platforms everywhere on the Earth??? Why did they bother to put USB-C on a Macbook only to not use it anywhere else when we KNOW that the whole world will soon be using USB-C ports for everything (including Thunderbolt 3). Apple seems obsessed about getting their high-end models down in price at the cost of functionality (3rd rate GPUs; old hard drives, AMD anything....) and yet they've got a Mac Pro that once again just sits there becoming completely out of date, overpriced to hell and not upgradeable even for the video card because they insisted on using custom connectors instead of an industry standard internal slot (guaranteeing you can't make one into the ultimate gaming Mac unlike Mac Pros of years past that were at least up-to-date for the year they came out and could be made into an actual useful desktop for non-pros even if it meant over-spending). Now there is no "high-end" Mac. They're all two-bit compromises for markets that didn't ask for them or want them. It's really unreal how stupid their design decisions are. Maybe number Johnny Five should have spent more time in engineering and less time making flat ugly graphical changes to OS X! How HARD is it to simply make a machine that has an up-to-date i7, 16GB of ram standard, a REAL GPU (like a NVidia Maxwell capable of actually driving a 4k/5k display at usable frame rates) and standard SSD drives of 512GB or greater internal? Is that really such a hard thing to make? Or would their massive profit margin simply price the machine out of the stratosphere? Given we KNOW Thunderbolt III is just around the corner with all kinds of new goodies, I can't see why anyone would want to buy a new Mac right now that didn't have to, let alone one with a Broadwell chipset in it when it's already obsolete. What I really want to see is a Macbook Pro 15" model with Thunderbolt III using USB-C ports (plus a couple of USB3 ports included on-board for usability without a hub) and the capability of using an external high-end graphics card for gaming and the like (whether or not it's running OS X or Windows through Boot Camp). In that case, the included GPU wouldn't be as important since it would likely be docked for gaming and finally having a way to upgrade the GPU for such uses would mean the computer isn't obsolete in two years (since CPU upgrades are typically slow and not needed whereas GPU improvements make life or death for frame rates in a short period of time). In other words, I want ONE Computer To Rule Them All. That means no more desktops but a notebook that can plug into a hub and become a real desktop with one USB-C plug and Thunderbolt III bandwidth. The iMac is not needed with such a computer becoming available nor any desktops except for specific power uses (leave that to a properly made Mac Pro). But Apple seems unaware of such possibilities just like they are blind to offering touchscreens for those that might need/want them even if it's just in Windows mode (so they buy a Mac instead of a PC and thus generate Apple profit instead of losing a sale). No new Thunderbolt display? :( Where the slimmer profile and USB-C connectivity? Force Touch is great, but I don't want to have to get rid of accessories just because the battery wears down over time and won't hold a charge. Also, like [USER=94689]@EvilEvil[/USER] said in another thread, where they've put the connector on the Magic Mouse means you can't use it while it's charging. So if you forget to charge it and it dies on you while your using that new iMac, you're screwed. I cannot believe that it is nearly 2016 and Apple are still providing 5400rpm drives as standard. Take it from me, those drives are painfully slow and really slow down the machine as a whole ruining the experience somewhat. They should by now have 256gb SSD as standard, or at least a Fusion drive of some kind.